Last week, my husband and I went to the funeral for his godfather, Demetrios, who had fallen asleep a few days prior from cancer. May his memory be eternal. At one point during the visitation, I came into the room where Demetrios’ body lay and found my husband standing quietly in the back corner while others milled around closer to the casket. “What are you thinking about?” I asked him. We had been there for a few hours by that point in the morning. “The inscription on that icon, and how hard it is to translate into English,” he answered, pointing to the large icon of the Theotokos and Christ that filled the apse of the chapel we were standing in. The Theotokos had her hands outstretched in orans position, and Christ as a child was embedded in a kind of bubble within her figure. Flanking the Theotokos was an inscription after which this icon tradition is named: Χώρα του Αχωρήτου (Chora tou Achoretou). 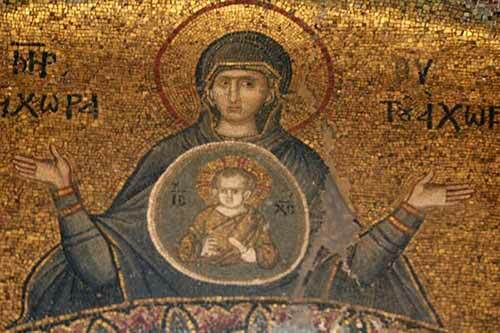 The most famous example of this image is a mosaic icon found in Chora Church in Constantinople. After a brief discussion about some other aspects of this inscription as translated from Greek–namely the sense of space or field captured in the Greek word Χώρα–my husband said something that has stuck with me. Χώρα, he went on to say, has to do with fit, something fitting into something else, like a puzzle piece or a hand in a glove. I’ve been thinking about this exchange in the days since, the almost apophatic limits of language and translation to convey what, ultimately, is unconveyable. I’ve also been thinking about the difference, in my mind at least, of fitting versus containing. In our vocabulary, containing and containment can pertain to a neutral and somewhat ineffectual act. It’s what you do in a last-ditch effort to bring order to an over-stuffed closet. It’s what you do to deal with a contagion that you don’t know how to treat or cure. We don’t speak of anyone else’s womb as “containing” a baby, even if technically that’s true. Why? Because “contain” is almost always used for impersonal and inanimate objects, and for things that bear no other relationship other than the container being big enough to store whatever is being stored there. “Fitting” carries within it a sense of containment but also compatibility. A glove can contain a hand, but it could theoretically also serve to contain countless other objects–peas, ball bearings, dimes (that’s a “deep album” reference to The Office, you’re welcome). Inside jokes aside, though, a glove can contain many things, but it specifically fits a hand. In other words, “fit” connotes not only size, but also shape and purpose. My husband’s comment helped me see the relationship between Christ and the Theotokos in a slightly new way, like twisting the kaleidoscope a bit further to reveal a new configuration of the same elements. 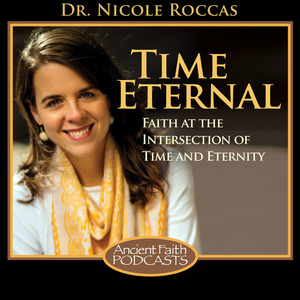 The co-eternal Word of God was unfittable–a puzzle piece that did not have a place in our earthly puzzle, a hand that corresponded to no earthly glove. It was not just that He was bigger or more boundless than our finite reality, but in being so, in a certain way simply didn’t correspond to our finiteness. In proclaiming that the Theotokos “fit” the “unfittable” Christ, we are not simply saying that her womb was mystically more spacious than the heavens (as the inscription on the Platytera, another beloved icon of the Theotokos, reads). We are also, I think, asserting a kind of correspondence and coherence that goes beyond merely containing as we normally think of it (at least in English). Christmas, more than any other time of year, is a time when we proclaim and give thanks for this correspondence, for the event of the unfittable Christ fitting into humanity. But was it Him squinching and shaping Himself to cohere to us? I see it the other way around. It’s the Theotokos–as an icon of humanity–who was made to fit to Christ. Just as a glove is fashioned to fit a hand, the Theotokos was made to bear Christ–and the exercise of her free will toward God only further molded her to fit the shape of Christ. It’s as though all along, from creation and through the abyss of sin and the many centuries of Israel’s history, God was shaping the denatured shape of humanity to fit or re-fit the shape of His Son. Just as Mary was made to fit Christ, so are we. Our hearts and souls are made in the necessary shape and size to cohere to Christ, and even as we warp that shape through sins and harmful thoughts, through repentance we can “re-shape” and “re-form” our lives to fit Him once again. As we journey again to Christ’s advent this Christmas, may we also venture to fit within ourselves the mystery of the unfittable Christ. 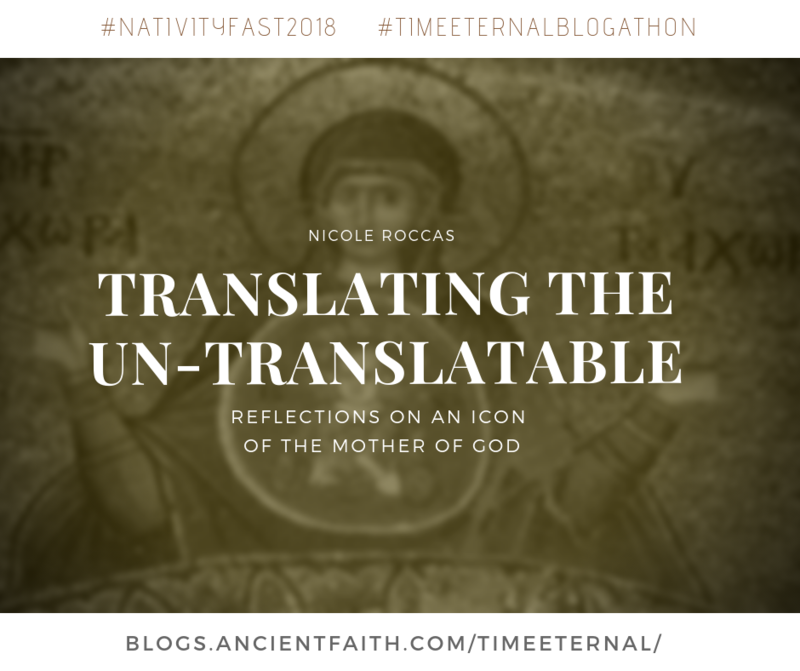 This post is part of a Nativity Fast blogathon on the Time Eternal Blog. See the rest of the posts in the series here. During the recent wildfires burning out of control here in the United States, the percentages of their containment was frequently in the news. Another twist of the kaleidoscope. Thanks for pointing that out! Poignant, if tragic, connection.